Antonio González Barros (of Intercom) You have the amiable habit of sharing the fragment and a brief review of some book that seemed interesting, every Monday morning. That's how I met "Peaks and valleys"As little blurb about an interesting book that came to my email from my former boss. The review was interesting and author, Spencer Johnson (author of "Who has taken my cheese“, “The present“, “The One Minute"And so many other good books), I know that I like and it offers an entertaining way (although parabolic) good advice both personal and enterprise level. So last week, one of the visits I make to my usual bookstore in search of science fiction, I decided to buy it. The book reads in a couple of hours or less. The author presents us with life as a continuum of peaks (good times) and valleys (not so good times) and reflects on the cause-effect relationship between the two. To write this review I will take as a basis the summary made by the author himself, in the final pages of the book, and I will add my comments about it (in brackets and italics). 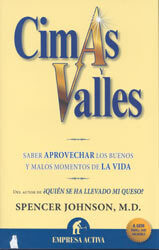 Use your CIMAS AND VALLEYS IN YOUR WORK AND IN LIFE, TO MANAGE YOUR GOOD AND YOUR bad. Make your reality is your ally. You're temporarily on top of a peak or in the depths of a valley, ask yourself: What is the truth in this situation? Rate and manage your good times wisely. I am humble and grateful. Do more of what got you there. Keep doing things better. Do more for others. Economizes for your next Valleys. Follow your perceptive vision. Imagine enjoying a better future with details as specific and credible soon enjoy doing what you take there. Share it with others! It helps people to good and bad times are also helpful. In short, it is a book 100% recommended that 90 pages can help a lot in these times of crisis in which more than one is plunged into a valley, so it is worth making a small investment in time it takes to read the book and then have 3 or 4 hours to reflect on what they have learned, notebook in hand, and draw up a plan.